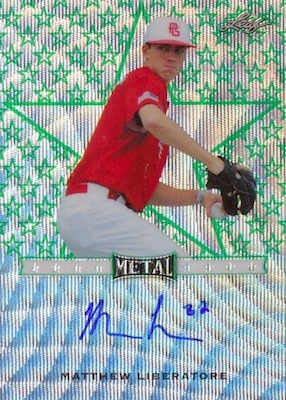 Continuing the standalone format, 2017 Leaf Metal Perfect Game All-American Baseball marks the second edition of the prospect-driven set. Highlighting participants from the 2017 Perfect Game All-American Classic, each box includes eight autographs. Featuring 53 draft prospects, the PG All-American Classic event roster is filled with some of the very best high school talent on the diamond. 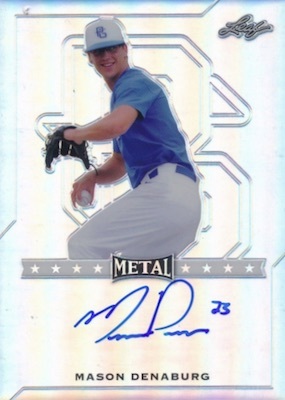 These young players contributed their signatures for a variety of inserts, including Metal Autographs with limited parallels like Super Prismatic (1/1), and the rainbow of Colored Etch Star versions via Leaf's Wave Foil technology. 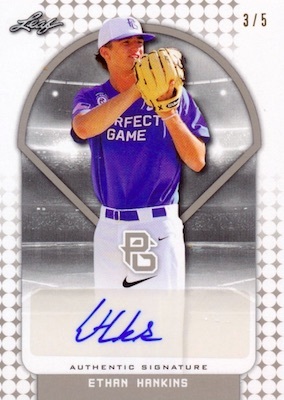 The 2017 Leaf Metal Perfect Game All-American Baseball checklist also includes Gameday Autographs (#/5 or less) on cards that were issued at the Petco Park showdown between the East and West teams. Displaying gear swatches from hats, jerseys and pants worn at the photo shoot for the event, the Patch Autograph cards are numbered to no more than 12 copies. 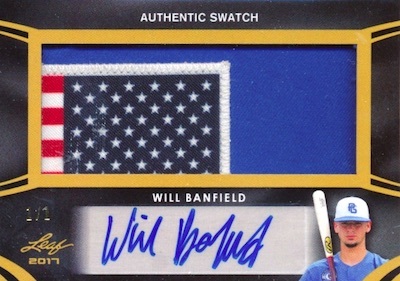 On average, collectors can look forward to one signed relic card per box. Coming in even lower than the 2016 debut, total production for 2017 Leaf Metal Perfect Game All-American Baseball is limited to 109 cases, or 1,635 boxes. Shop 2017 Leaf Metal Perfect Game All-American autographs on eBay. PRISMATIC PARALLELS: Blue #/30, Purple #/35, Pink #/20, Black #/15, GGreen #/10, Red #/5, Orange #/2 (Bonus/Promo), Gold 1/1, Super 1/1, Plates 1/1 (Bonus/Promo). STAR ETCH PARALLELS: Blue #/12, Purple #/9, Pink #/7, Black #/5, Green #/4, Red #/3, Gold #/2, Orange 1/1, Super White 1/1 (Bonus/Promo), Super Black 1/1. 53 cards. Serial numbered #/5. PARALLEL CARDS: Black #/4, Blue #/3, Red #/2, Purple 1/1, Plates 1/1 (Bonus/Promo). 53 cards. Serial numbered #/12. PARALLEL CARDS: Pink #/9, Orange #/5, Platinum #/3, Lavender #/2, Gold 1/1, Charcoal 1/1 (Bonus/Promo), Plates 1/1 (Bonus/Promo). View the 2017 Leaf Metal Perfect Game All-American Baseball checklist spreadsheet. I am really loving this product. It’s great for prospecting and has a lot of bang for your buck. Out of 2 boxes I pulled some nice prospects, a 1/1 gold and two nice big patches with autos.